Construction has been under way for months on the south portal site for the tunnel under downtown Bellevue. Part of the Sound Transit East Link extension, the tunnel will host light rail service in Bellevue and run between the future transit stations at East Main and Downtown Bellevue. What you might not know . . . Instead of a tunnel boring machine, this tunnel is being built using the sequential excavation method (SEM). SEM uses an excavator and cutting equipment to take out soil. As soil is removed, lattice girders are installed and then pressurized concrete, called shotcrete, is sprayed onto the tunnel sides, ceiling and floor. This method, vs a tunnel boring machine, should minimize disruption to surface streets, homes and businesses. East Link is scheduled to open in 2023 and is part of the 14 mile, 10 station light rail extension. When open a trip from downtown Seattle to downtown Bellevue will take about 20 minuted. The next extension is scheduled to open the following year linking stations to Redmond. 2023 will be here sooner than we expect. Access to light rail is going to be a game changer downtown, adding appeal, convenience, prestige and value to downtown Bellevue’s business and residential communities. Rain or shine or full moon, there are plenty of fall and Halloween events for kids of all ages. Just some of the local events . . .
October 24th 5:00 – 8:00. Wear your favorite costume, funny or scary, and enjoy hands on fun in the spooky kooky laboratory, creepy cake walk, eerie art and magic. Pre-registration recommended. Information @425/637-8100. October 29th & 30th. International Ballet Theatre’s annual performance of Dracula. For tickets/information 425/822-7694. Small things can make a big difference and making even a small effort every day can have a big impact on the quality of where you live. Next time you’re walking to dinner or the movies, spending time with your kids in the park or walking your dog, take a minute to make a difference. There is no Poop Fairy! Make it a habit to pick up more poop. Certainly clean up after your own dog but carry an extra bag on your next dog walk and pick up someone else’s dog’s poop. Report it if you see a problem. Did a truck lose some of its gravel load in the street? Has overgrown landscaping blocked a sidewalk? Is a clogged storm drain overflowing? Its quick and easy to report problems using the MyBellevue app on your phone. Touch the “new request” button to report a problem or to request a service. 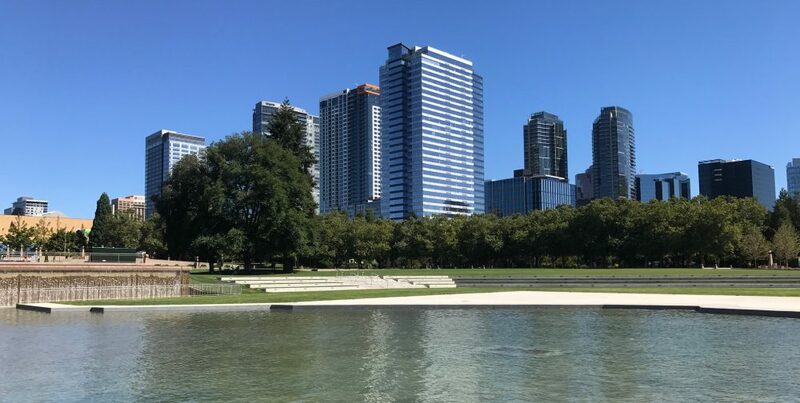 While the City of Bellevue does a great job maintaining the city’s parks, landscape and maintenance staff can’t be everywhere all the time (see Poop Fairy above). Lend a hand – if you see trash left behind, pick it up and place it in the closest trash can. SLOW DOWN! As Bellevue’s residential and employment population grows so do the number of pedestrians on the streets. As a courtesy and to keep our streets safe, slow down, pay attention, look twice before making that right-turn-on-red and NO cell phone use or texting. The city is full of people young and old, bike riders, children and pets – keep everyone safe. Get to know your neighbors. Watch out for one anther, children and pets. You could discover a new friend, baby sitter, dog walker and maybe something new about your neighborhood. Volunteer. Check with local non-profit organizations and the City of Bellevue website for volunteer opportunities. Unfortunately one of the hazards of a growing city is an increase in homelessness. Next time you see someone who is obviously homeless, make eye contact, smile, say hello. Acknowledgement of another person can make their day. Carry $5 Starbucks cards and occasionally hand them out – the ability to buy a hot drink or sandwich for someone who doesn’t have the means to do so could make a big difference. Shop local. Support the many locally owned stores and restaurants throughout Bellevue. Visit area farmers markets. VOTE! There’s no better way to make your voice heard. As downtown Bellevue grows, so does the need for expanded life, fire and property emergency response. The Bellevue Fire Department, after completing an extensive study to examine how to meet the city’s current and future needs, has proposed construction of a new Fire Station 10. The City Council has approved funds for property acquisition for Fire Station 10 in the 2015-2021 Capital Investment Program. The proposed site for the new station is on the west side of 112th Avenue NE and NE 12th Street, just north of McCormick Park. The 2.82 acre site will not affect McCormick Park. Downtown’s residential population is expected to increase to 19,000 by 2030 and the city’s employment base is expected to grow to 70,000+ by 2030. The Fire Department’s goal is to reduce the target travel time to the increasing number of high-rise residential and commercial buildings and ensure quick response times for the nearby neighborhoods of Northtowne, Bel-Red, Northwest and West Bellevue and Wilburton. Construction of Fire Station 10 is scheduled for 2019 and will take approximately 18 months with an occupancy date in 2021. For more information about Fire Station 10 visit the City of Bellevue’s website at www.ci.bellevue.wa.us. Big changes coming to downtown Bellevue with the addition of several new shopping and dining experiences celebrating grand openings in the coming weeks. Carmines will offer an upscale white tablecloth dining experience plus an expansive covered, heated patio. Located at 88 102nd Avenue NE at the south side of the Downtown Park. Scheduled to open September 12th. The organic grocer’s small format, less expensive store is scheduled to open September 14th at Bellevue Square in the space previously occupied by J C Penney. Wild Ginger has been selected to operate a quick, casual dining space within the store. Opening September 13th, REI is relocating its Redmond store to Bellevue. REI will open in the new retail space shared with Trader Joes and Home Goods at the corner of NE 4th Street and 116th Avenue NE. The Grand Opening celebration is scheduled for September 23-25. Trader Joe’s is targeting a mid-October opening at the new location just east of downtown Bellevue. Trader Joe’s will share space with REI and Home Goods. Home Goods, the popular home fashion and decor retailer, is planning its grand opening for October 2nd. Home Goods will be joined by REI and Trader Joe’s. CAFE TROPHY – Trophy Cupcakes has relocated to a larger space at The Bravern and transitioned to a bakery-cafe-champagne bar. The cupcakes we love will still be featured along with an expanded menu of breakfast and lunch items and evening dinner selections with an impressive wine and beer list.